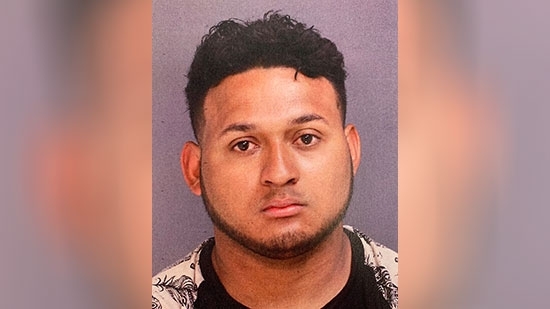 Upper Darby Police have arrested a man wanted for two separate luring incidents last week. 25-year-old Rudy Najera-Arita is charged with two luring attempts of children and related offenses. It happened around 3 p.m. Friday, 4/5, near Long Lane and Clinton Road. An 11-year-old girl reported that a man in a car tried to get her to come into his vehicle. She fled. Twenty minutes later, near Midway Avenue and Littlecroft Road, a 16-year-old girl told police that a man also tried to get her into his car and that he was exposing himself. They both described a dark gray, silver or blue sedan with tinted windows, likely a 2016 Toyota Corolla. Police found a car matching the description in surveillance video from the times of the attempted abductions. Najera-Arita was pulled over on Monday night, 4/8, when a patrol officer saw the vehicle matching the partial plate and description. He is being held on $300,000 cash bail. Immigration Customs Enforcement put a detainer on the suspect. Najera-Arita is a Honduras native and is living in Upper Darby illegally. Federal authorities have been called in to assist in the investigation of a massive warehouse fire on Sunday night, 4/7, in Port Richmond. The National Response Team of the Bureau of Alcohol, Tobacco, Firearms and Explosives, along with members of the ATF Philadelphia Arson and Explosives Task Force (ATF, Philadelphia Fire Marshal's Office, and Philadelphia Police Department personnel) have been activated to assist in investigating the four-alarm fire at The Thrifty Irishman thrift store, located at 2226 E. Butler St. The fire started around 7:21 p.m. Sunday. It caused an estimated $1.8 million in damage. The NRT was called in to help with the origin and cause investigation due to the size of the building, amount of fire damage, and safety concerns. "ATF is committed to working with our partners at the Philadelphia Fire Marshal’s Office and the Philadelphia Police and Fire Departments by adding our expertise and resources to the investigation", said Special Agent in Charge Donald Robinson, of the ATF Philadelphia Field Division. Philadelphia Police are looking for a group of teenagers who assaulted a 63-year-old man and robbed him in Center City last week. It happened around 8 p.m., Tuesday, April 2nd, on the 1300 block of Walnut Street. The juveniles attacked the man and stole his wallet before fleeing in unknown directions. They were captured on surveillance video. Investigators are looking for help identifying the suspects. If you have any information about this crime or suspects, contact Central Detective Division at 215-686-3093. Philadelphia 76ers have hired Lindsey Harding as their new player development coach. She becomes the Sixers first female coach and just the 7th in the NBA. The 34-year-old was hired as a scout for the Sixers last summer. Harding was the #1 pick in the 2007 WNBA draft out of Duke University. She played 9 seasons in the WNBA and for seven European teams. In 2015, she was an assistant coach for Toronto during the summer league. This past season she was involved in player scouting including assessing Jimmy Butler, Tobias Harris and Boban Marjanovic. The Philadelphia Eagles will be traveling to Jacksonville to face the Jaguars and our former Super Bowl LII MVP Nick Foles during Week 2 of the preseason. Being the preseason, the starting QB will not see a lot of action, perhaps just one drive. The Eagles are not scheduled to play against the Jaguars during the regular season.